I just took this picture. My work area is down in the basement of our house. It’s only partially finished so we get a few bugs down there – especially spiders. Since I was a kid I’ve always liked spiders so it doesn’t particularly bother me when there are a few around. This one was right in front of my desk. It always seemed to be in exactly in the same position so I began to suspect that it was dead. In any case I decided to take a picture of it. I tried using my DSLR with a zoom lens on a tripod, but I didn’t much like the results. So I reached for my RX-100 and moved it really close to take this picture. Of course it’s not all that clear and it’s quite noisy, but I still like it – especially the way the spider stands out against the white wall. 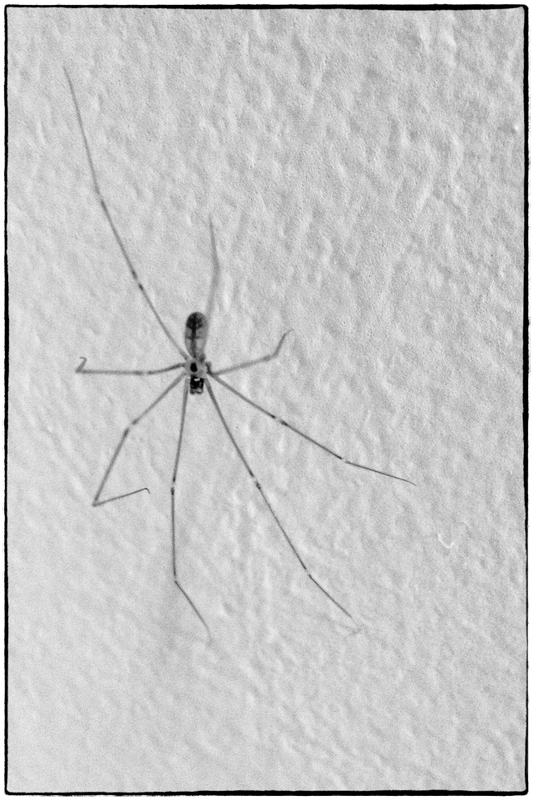 Incidentally, when I moved in close to take this picture the spider scuttled away. I guess it wasn’t dead after all.